The cost of LBP on the UK economy is currently estimated to be approximately £12 billion per year. In addition, the prevalence of LBP creates increased demand and high costs for the NHS, estimated at approximately £12.3 billion per annum. With an ageing population this figure is only set to increase, creating an additional strain and financial burden on an already overstretched NHS service. Generally, most cases of acute LBP recover within 4 to 6 weeks, with most back pain episodes resolved within primary care management . Guidelines are in place to aid primary care providers in managing this population. In the UK these guidelines are produced by NICE (2016), and are a recommended standard of care for LBP in England and Wales . They are for use by all primary care clinicians consulting service users suffering from LBP. Self-management 1.2.1 Provide people with advice and information, tailored to their needs and capabilities, to help them self-manage their low back pain with or without sciatica, at all steps of the treatment pathway. Include: information on the nature of low back pain and sciatica encouragement to continue with normal activities. Exercise 1.2.2 Consider a group exercise programme (biomechanical, aerobic, mind–body or a combination of approaches) within the NHS for people with a specific episode or flare-up of low back pain with or without sciatica. Take people's specific needs, preferences and capabilities into account when choosing the type of exercise. Manual therapies 1.2.6 Do not offer traction for managing low back pain with or without sciatica. 1.2.7 Consider manual therapy (spinal manipulation, mobilisation or soft tissue techniques such as massage) for managing low back pain with or without sciatica, but only as part of a treatment package including exercise, with or without psychological therapy. Psychological therapy 1.2.13 Consider psychological therapies using a cognitive behavioural approach for managing low back pain with or without sciatica but only as part of a treatment package including exercise, with or without manual therapy (spinal manipulation, mobilisation or soft tissue techniques such as massage). 1.2.14 Consider a combined physical and psychological programme, incorporating a cognitive behavioural approach (preferably in a group context that takes into account a person's specific needs and capabilities), for people with persistent low back pain or sciatica: when they have significant psychosocial obstacles to recovery (for example, avoiding normal activities based on inappropriate beliefs about their condition) or when previous treatments have not been effective. The most recent guidelines do not offer recommendations for prescription of treatment, therefore it can be a little unclear on what would be classed as adhering to these guidelines. Based on published research and clinical reasoning a reasonable outcome measure for adherence can be determined . Three or more NHS physiotherapy treatment sessions, with the inclusion of exercise as part of the treatment plan would be deemed appropriate. Patients receiving less than this could be classified as receiving non-adherent care. This number was determined by evaluating the number of exercise sessions a variety of studies had reported when investigating the effects of exercise on LBP. The majority of studies reported in number of weeks rather than number of actual sessions, which was generally between 8-12 weeks. It would be reasonable to expect that this would equate to approximately 3-4 physiotherapy sessions and that this would be a fair length of time for treatment to be deemed successful or not. The limitations of using this method to determine reasonable number of treatments are that individual studies used varying type, intensity, duration and frequency of exercise therapy, producing variations for number of sessions. One could argue, that 1-2 sessions of exercise lead therapy would be inadequate to produce a positive change. However, due to limited resources and NHS funding more than six sessions would not be currently feasible. There remains no clear evidence which suggests the optimal dosage of exercise or number of treatment sessions to produce the best outcomes for LBP patients. Establishing standards to classify adherent care, therefore still remains difficult. 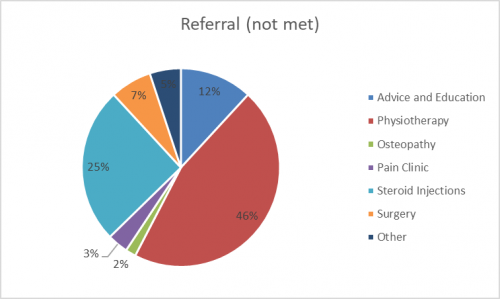 However the referral system is not always effective, whilst some patients may not receive the specialist care they need, many are being referred unnecessarily. This places huge demands on overstretched services as well as having large cost implications for the NHS. Therefore, adhering to guidelines and using evidence based practice within primary care is of utmost importance and understanding barriers as to why clinicians may not do this could help future practice. It would be reasonable to apply research findings of adherence from differing countries to the United Kingdom [UK]. Koes, van Tulder, Ostelo et al. (2001) conducted an international comparison of guidelines published up to year 2000 for LBP from eleven countries. Koes et al. (2001) found similarities within guidelines for diagnostic triage and therapeutic interventions, and a lack of guidance of when to refer non-specific LBP patients for specialist opinion. Generalising standards of care internationally should remain valid, as updates in evidence guide updates in guidelines across nations, however some minor variations may exist and should not be ignored. Studies which have explored guideline adherence for LBP have found variable levels of adherence with considerable variation amongst clinicians . A systematic review of randomised controlled trails reported that, between 69-90 percent of patients were taking medication of higher levels of opioid prescription against primary care recommendations . Minimal information suggested that doctors were promoting physical activity for the management of LBP to their patients . Considerable variation was found between the use of X-ray’s for LBP in primary care between countries, 4-7% in the United Kingdom (UK) according to two primary care studies . A meta-analysis for all other outcome measures and chronic patients was not possible due to study heterogeneity . A cross sectional study by Layne et al. (2017) sent out questionnaires to explore patient’s primary care medical history upon referral to a secondary care centre in Canada. Medications were found the most common modality, with opioids the second most used analgesia . Twenty-eight percent of patients received adjacent modalities, massage being the most common . It was not clear if massage had been prescribed as part of an active treatment package recommended by Canadian guidelines. Forty-three percent of the sample did not perform any form of exercise prior to referral to secondary care and only 14% performed specific LBP exercises recommended by primary care guidelines . It was not made clear if this was due to lack of exercise prescription, pain severity or poor patient adherence to exercise. Only 12% of patients exhausted all four categories of; mediations, referral to an allied health provider, adjunct modalities and exercise, 22% received medication only . Just over 40% of the sample was not assessed by an allied health provider within primary care prior to referral, and a lack of active intervention involving patient participation was identified, with no clarity of a definitive reason as to why this was the case. A Brazilian cross-sectional survey study, explored adherence of clinical practice guidelines [CPG’s] published by the American Physical Therapy Association [APTA] of six vignette case studies and the choice of treatment(s) by experienced physiotherapists . The rate of full adherence for CPG ranged from five to 25%, partial adherence 42-75% and non-adherence 15-75% . For full adherence to CPG’s at least two mandatory interventions had to be selected for each case, for non-adherence none of the mandatory interventions was selected . Education to maintain an active lifestyle was selected in below 20% for all cases, despite education being an essential management component for all LBP patients  Interferential currents and TENS were chosen in under 40% of cases, despite not being recommended by CPG’s . A clinical audit conducted in the Netherlands did establish adherence parameters using Dutch guidelines . 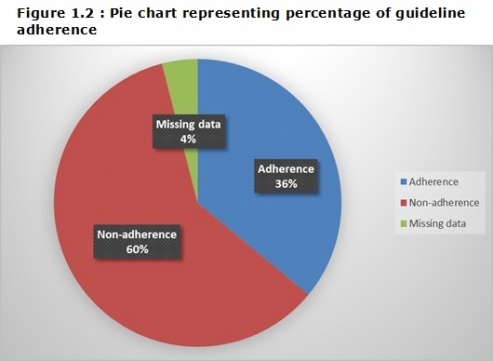 Adherence parameters was met depending on the number of treatment sessions, prescription of exercise or advice and patients being set at least one treatment goal . Only 53% of all treatment episodes met the adherence parameters . Eighty-eight percent of treatment episodes incorporated either exercise therapy or advice, passive interventions, whereby the patient did not actively take part in therapy was used in 12% of cases . Swinkels et al. 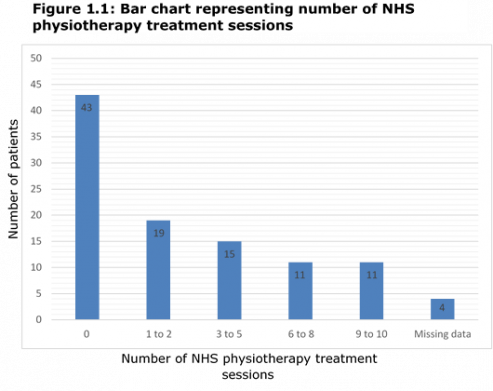 (2005) identified an excessive median number of eight treatment sessions being offered to patients with acute symptoms, whilst more chronic cases having a median value of nine sessions, only one additional session. Hanney, Masaracchio, Liu et al. (2016) who conducted a systematic review and Rutten et al. (2010) found that with increased adherence the need for as frequent physiotherapy consultations reduced [Probability [P]= 0.005, Confidence Intervals [CI]= -0.16, -0.03]. However, a reduction of physiotherapy consultations did not save substantial savings . The actual cost savings were not presented due to the heterogeneity of studies and therefore a meta-analysis could not be performed . Avoidance of inappropriate use of radiology imaging has been associated with reductions of inappropriate treatment, including injection therapy and surgery . The outcomes presented by Hanney et al. (2016) cannot be generalised to physiotherapy practitioner adherence alone, with CPG's used across multiple multi-disciplinary professionals within primary care. Rutten et al. (2010) conducted a cohort study to investigate the relationship between guideline adherence and care outcomes . Improving the management of LBP improved patient management and their outcomes . Greater adherence was associated with reduced Quebec Back Pain and Disability Scale [QBPDS] score [P=0.04, CI= 0.01,0.41], but when including the whole study sample, no significant reductions for average pain scores was identified [P=0.9, CI=-0.13,0.16] . However, adherence saw greater reductions in QBPDS and pain scores amongst chronic LBP patients . Limited evidence has explored outcomes of guideline adherence, only four studies were suitable for inclusion in the systematic review by Hanney et al. 2016. More research would be necessary to confirm any links of adherence with improved patient outcomes, reductions in healthcare utilisation and cost. Limited research would suggest clinician’s knowledge of guideline based care and the outcome of this would be lacking. An unpublished audit and service evaluation was carried out in 2016 investigating guideline adherence for low back pain using data from patients referred to a UK spinal outpatient's department. The following graphs demonstrate number of treatments received in primary care before referring to secondary care, number of patients in secondary care who had and hadn't met guidelines and finally to which treatments the non-adherence group were referred to following triage within secondary care.. In the Nottingham area a high proportion of patients are not receiving appropriate LBP management in primary care. A systematic review and meta-synthesis of qualitative studies by Slade, Kent, Patel et al. (2016) explored primary care clinician’s perceptions of LBP guidelines and the barriers they are facing to implement these. Other studies indicate similar findings regarding LBP guideline adherence. A recent cross sectional study by Layne et al (2017)  who investigated referrals from PC to SC for LBP patients, found that the majority of patients had not met LBP guidelines. The Canadian clinical practice guidelines (CPG) lists recommendations for LBP management prior to referral to secondary care. These recommendations were grouped into four modalities for the purpose of the study. Researchers used the Canadian physical activity guidelines to determine if patients had met the exercise recommendations. The findings showed that out of 229 participants, only 12.2% had exhausted all CPG recommendations before referral to secondary care. 61.1% received two or less interventions and 21.8% had received medication only. Clinicians, including physiotherapists and GP’s believe that CPG’s stifle clinical judgement and professional autonomy . They described the guidelines as constraining and prescriptive, controlling practice . However, one could argue that NICE  recommendations for management lack clarity and are open to interpretation . With no clear prescription for number of treatment sessions or when it would be appropriate to refer to secondary care. Majority of clinicians reported beliefs that guidelines were not supported by research evidence and that the evidence was not sufficient to inform guidelines . That, CPG’s are produced to reduce costs rather then improve patient outcomes . A sample of physiotherapists strongly believed in the principles of evidence-based practice and that NICE guidelines for LBP was relevant to their practice . However, clinicians found current recommendations unpractical and unrealistic to clinically implement . Due to time constraints to read and assimilate CPG’s to inform their practice . These findings highlight an issue with primary care management of LBP and musculoskeletal (MSK) patients. A review by Heron and Ryans (2016) state that MSK patients make up around 20% of the GPs caseload and that GP’s very often feel uncomfortable in managing these patients and therefore refer to secondary care. Attitudes and clinical beliefs of GP’s and physiotherapist’s can influence outcomes of LBP according to Bishop et al (2008) . A UK cross sectional postal survey studying the clinical practice and attitudes of health care professionals (HCP’s) on LBP found that the majority of HCP’s did not strictly follow NICE guidelines. 28% reported, that if deemed necessary, they would advise patients to stay off work, which is conflicting to NICE guidelines. Advice such as this could strengthen negative beliefs, increase the risk of chronicity and lead to damaging fear avoidance cycles. Those practitioners who adopted a more biomedical approach to LBP were found to be much less likely to adhere to guidelines compared to those who adopted more of a psychosocial belief. The study revealed that clinical practice behaviour for the management of LBP is diverse within primary care. However a proportion of all clinicians from all disciples referred to imaging for a definitive diagnosis and fears of missing an underlying spinal pathology . Concerns of malpractice litigation have been found to increase LBP imaging rates . Most clinicians had a belief that imaging identifies a definitive pathoanatomical source for diagnosis of LBP . Diagnosing a pathoanatomical source has been associated with GP’s lack of confidence in their ability to assess and clinically reason LBP care, whereas AHP’s including physiotherapists appeared more assured . GP’s tend to use referral to imaging as a substitute of consultation time with the patient, or as a means whilst awaiting long waiting lists for physiotherapy or specialist care . GP’s in particular used imaging to relieve patient anxiety, build trust and better engage the patient in therapeutic strategies . Imaging was found to reassure the professional of any adverse treatment effects . However, imaging can reveal benign findings such as disc degeneration, which can be misinterpreted as the cause of pain, leading to further fear, disability and inappropriate intervention . Patients find it difficult to comprehend or accept, that the treatment pathway would be unlikely to change based on imaging results . Patients seek a diagnostic label to explain their LBP, assist in treatment selection and validate their pain experience . Clinicians believed patients expect diagnostic intervention, to identify the problem and give a specific diagnosis . There are fears that patients would doubt the clinical ability of the professional if they did not refer to imaging . Adherence to LBP guidelines are low to modest, with considerable variation amongst clinicians and professional groups, which could lead to poor outcomes for patients in healthcare services. Professionals exercise their professional autonomy over and above written recommendations from guidelines. Some professionals still seek a definitive pathoanatomical diagnoses to be able to manage patients with LBP. Current high demands and time pressure in clinical practice, make it unrealistic for clinicians to apply guidelines in the current health service climate. Research that has explored adherence is lacking, with reports of inadequate methodological quality. Education and clinical audit are both strategies that can be used to monitor and improve guideline adherence in the future. However, without having a standardised valid and reliable outcome measure for adherence, assessing and quantifying adherence bring with it its own challenges. ↑ Maher, C., Underwood, M. and Buchbinder, R. (2017) Non-specific low back pain. Lancet [online] 389(10070): pp.736-747. Available at: http://www.thelancet.com/journals/lancet/article/PIIS0140-6736(16)30970-9/fulltext [Accessed 11th November 2017]. ↑ National Institute for Health and Care Excellence [NICE] (2013) Into practice guide. [online] London: NICE. Available at: https://www.nice.org.uk/process/pmg30/chapter/introduction-and-background [Accessed 12th November 2017]. ↑ Kamper, S. J., Apeldoorn, A. T., Chiarotto, A., Smeets, R. J., Ostelo, R. W. J. G., Guzman, J. and van Tulder, M. W. (2014) Multidisciplinary biopsychosocial rehabilitation for chronic low back pain. Cochrane Library [online] 9(CD000963): pp.1-209. Available at: http://onlinelibrary.wiley.com/doi/10.1002/14651858.CD000963.pub3/abstract [Accessed 11th November 2017]. ↑ 7.0 7.1 Geneen LJ., Moore, RA., Clarke, C., Martin, D., Colvin, LA., Smith, BH. (2017). Physical activity and exercise for chronic pain in adults: an overview of Cochrane Reviews. Cochrane Database of Systematic Reviews. 2017 (4). ↑ Middelkoop, M V., Rubinstein, S M., Verhagen, A P., Ostelo, R W., Koes, B W., Tulder, M W. (2010). Exercise therapy for chronic nonspecific low-back pain. Journal of Best Practice & Research Clinical Rheumatology. Vol. 24. Pp. 193-204. ↑ Henchoz, Y., So, AKL. (2008). Exercise and nonspecific low back pain: A literature review. Joint Bone Spine. Vol. 75. Pp 533-539. ↑ Rainville, J., Hartigan, C., Martinez, E., Limke, J., Jouve, C., Finno, M. (2004). Exercise as a treatment for chronic low back pain. The Spine Journal 4. Pp. 106-115. ↑ 12.0 12.1 12.2 Berendson, A J., Jong, G M., Meyboom-de-Jon, B., Dekker, J H., Schuling, J. (2009). Transition of care: experiences and preferences of the primary/secondary interface – a qualitative study. BMC Health Services Research. Vol 9. (62). ↑ 13.0 13.1 Akbari, A., Mayhew, A., Al-Alawi, M A., Grimshaw, J., Winkens, R., Glidwell, E., Pritchard, C., Thomas, R., Fraser, C. (2008). Interventions to improve outpatient referrals from primary care to secondary care. Cochrane Databe of Systematic Reviews. Vol. 4. ↑ 15.0 15.1 Koes, B. W., van Tulder, M. W., Ostelo, R., Kim Burton, A. and Waddell, G. (2001) Clinical Guidelines for the Management of Low Back Pain in Primary Care. Spine [online] 26(22): pp.2504-2514. Available at: https://insights.ovid.com/pubmed?pmid=11707719 [Accessed 13th November 2017]. ↑ 16.0 16.1 16.2 16.3 16.4 16.5 16.6 Swinkels, I. C., van den Ende, C. H., van den Bosch, W., Dekker, J. and Wimmers, R. H. (2005) Physiotherapy management of low back pain: Does practice match the Dutch guidelines?. Australian Journal of Physiotherapy [online] 51(1): pp.35-41. Available at: http://www.sciencedirect.com/science/article/pii/S0004951405700519?via%3Dihub [Accessed 12th November 2017]. ↑ 17.0 17.1 17.2 17.3 17.4 17.5 Somerville, S., Hay, E., Lewis, M., Barber, J., van der Windt, D., Hill, J. and Sowden, G. (2008) Content and outcome of usual primary care for back pain: a systematic review. British Journal of General Practice [online] 58(556): pp.790-797. Available at: https://www.ncbi.nlm.nih.gov/pmc/articles/PMC2573978/#!po=2.27273 [Accessed 29th October 2017]. ↑ 18.0 18.1 18.2 18.3 18.4 18.5 18.6 Layne, EI., Roffey, DM., Coyle, MJ., Phan, P., Kingwell, SP., Wai, EK. (2017). Activities performed and treatments conducte before consultation with a spine surgeon: are patients and clinicians following evidence-based clinical practice guidelines? The Spine Journal. Available from: https://www.sciencedirect.com/science/article/pii/S1529943017309762. [Accessed: 14th February 2018]. ↑ 19.0 19.1 19.2 19.3 19.4 19.5 de Souza, F. S., Ladeira, C. E. and Costa, L. O. P. (2017) Adherence to Back Pain Clinical Practice Guidelines by Brazilian Physical Therapists: A Cross-sectional study. SPINE [online] 42(21): pp.E1251-E1258. Available at: https://www.ncbi.nlm.nih.gov/pubmed/28399548 [Accessed 17th November 2017]. ↑ 20.0 20.1 20.2 20.3 20.4 20.5 Hanney, Masaracchio, M., Liu, X. and Kolber, M. (2016) The influence of physical therapy guideline adherence on healthcare utilization and costs among patients with low back pain: A systematic review of the literature. PLOS ONE [online] 11(6): pp.e0156799. Available at: https://www.ncbi.nlm.nih.gov/pubmed/27285608 [Accessed 2nd November 2017]. ↑ 21.0 21.1 21.2 21.3 21.4 21.5 Rutten, G. M., Degen, S., Hendriks, E. J., Braspenning, J. C., Harting, J. and Oostendorp, R. A. (2010) Adherence to Clinical Practice Guidelines for Low Back Pain in Physical Therapy: Do Patients Benefit?. Physical Therapy [online] 90(8): pp.1111-1122. Available at: https://academic.oup.com/ptj/article-lookup/doi/10.2522/ptj.20090173 [Accessed 5th November 2017]. ↑ 22.00 22.01 22.02 22.03 22.04 22.05 22.06 22.07 22.08 22.09 22.10 22.11 22.12 22.13 22.14 22.15 Slade, S. C., Kent, P., Patel, S, Bucknall, T. and Buchbinder, R. (2016) Barriers to primary care clinician adherence to clinical guidelines for the management of low back pain: a systematic review and metasynthesis of qualitative studies. Clinical Journal of pain 32(9): pp.800-816. ↑ 23.0 23.1 23.2 23.3 23.4 O’Sullivan, K., Grunau, G. L., Forster, B. B., O’Sullivan, P. P., Flynn, T. and Darlow, B. (2017) I know what the imaging guidelines say, but…. British Journal of Sports Medicine [online] 0(0): pp.1-2. Available at: http://bjsm.bmj.com/content/early/2017/10/18/bjsports-2017-098194.info [Accessed 1st February 2018]. ↑ Heron, N., Ryans, I. (2016). What Musculoskeletal (MSK) Conditions are Referred from Routine Gerneral Practice (GP) and what Impact does this have on Developing Innovative Care Models for Patients with MSK Conditions in Primary Care? International Journal of Physical Medicine and Rehabilitation. Vol. 4(6). Pp. 1-10. ↑ 25.0 25.1 25.2 25.3 25.4 Bishop, A., Foster, N E., Thomas, E., Hay, E M. (2008). How does the self-reported clinical management of patients with low back pain relate to the attitudes and beliefs of health care practitioners? A survey of UK general practitioners and physiotherapists. Pain. Vol. 135 (1-2). Pp. 187-195. ↑ BMJ. (2015). Biopsychosocial care for chronic back pain. [Online]. Available from: http://www.bmj.com/content/350/bmj.h538?variant=fulltext& hwshib2=authn%3A1518364915%3A20180210%253A3897fb22-1778-4f09- 8809-245a2dfa0d92%3A0%3A0%3A0%3AlNmoZh18axZ71kn2oA9nEA%3D%3D. [Accessed: 10th February 2018].